Open house scheduled for August 4th, 11am thru 4pm. First time on the market in over 20 years! This expansive view home is located near quaint La Mesa Village in the upscale Highlands neighborhood. This bright home has dual pane windows and sliding doors, beautiful beamed ceilings, and a fireplace in living room. Open concept floorplan and hardwood floors. Great for entertaining, with backyard patio plus deck, and second deck off of living room with 180 degree view and mature landscaping. Tri-level four bedrooms, 2 ½ baths over 2,000sf. Close to SDSU, Grossmont College, highways 8, 94, & 125. 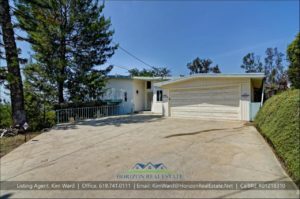 Click here for more details, including additional photos of 4536 Panorama Dr.
PreviousPrevious post:5867 Del Cerro BlvdNextNext post:Do I Need a Tax Identification Number When Selling San Diego Real Estate in Probate or a Trust?